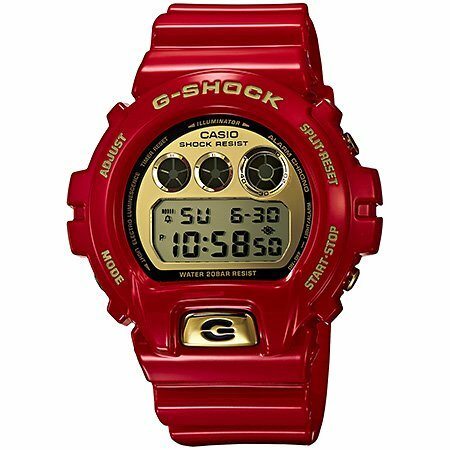 G-SHOCK The 30th Anniversary Limited Edition Watch in Red. A revamped classic 6900 men’s watch for the G-Shock 30 th Anniversary collection with golden mirrored LCD's and a 45mm gloss case; plastic resin band with gold metal buckle closure. Features: Shock Resistant 200 Meter Water Resistant EL Backlight with Afterglow Multi-function Alarm Hourly Time Signal Flash Alert Flashes with buzzer that sounds for alarm, hourly time signal, countdown timer time-up alarm 1/100 Second Stopwatch Measuring capacity: 00’00.00”-59”59.99” (for the first 60 minutes) 1:00’00-23:5959 (after 60 minutes) Measuring Unit: 1/100 second (for the first 60 minutes) 1 second (after 60 minutes) Measuring modes: Elapsed time, split time, 1st-2nd place times Countdown Timer Measuring unit: 1 second Countdown range: 24 hours Countdown start time setting range: 1 second to 24 hours (1-second increments, 1-minute increments and 1-hour increments) Other: Auto-repeat Full auto-calendar (pre-programmed until the year 2099) 12/24 Hour Formats Accuracy: +/-15 seconds per month Battery: CR2016 Approx. battery life: 2 years Module 3230 By G-SHOCK.